SK Group affiliates dominated the list of top-paying companies last year, especially its chemical units, which occupied the top four spots, corporate data showed Monday. Corporate tracker CEO Score reviewed the annual salary of 324 firms among the top 500 companies by sales who had submitted business reports in 2017. Results showed the biggest payer was SK Energy, whose average yearly salary was 152.2 million won ($142,376). It was followed by SK Global Chemical (147.1 million won), SK Incheon Petrochem (130 million won) and SK Lubricants (121.3 million won). 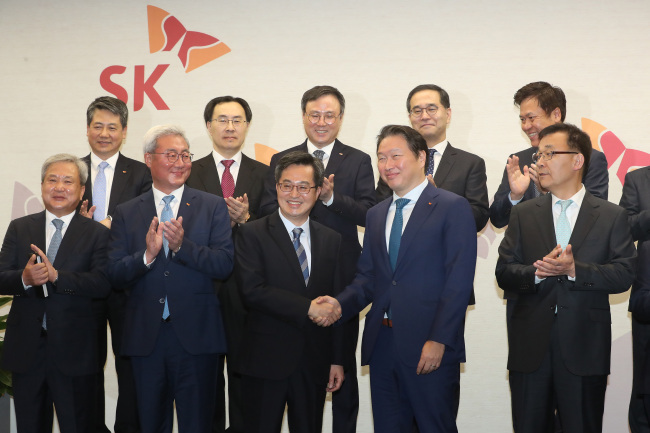 Eleventh-placed SK Innovation and SK Telecom, 18th, also paid more than 100 million won in annual salary, putting six affiliates of the business group in the upper ranks. SK Group companies also made a mark in terms of pay increases. SK Energy upped its pay by 200.6 million won from the previous year. SK Global Chemical awarded a 197 million won raise, while SK Lubricants raised its pay by 181 million won. SK Incheon Petrochem gave employees a 6.2 million won raise. Samsung Electronics came in 7th with 117 million won. LG Group's LG International was 24th with 100 million won. Among Lotte Group affiliates, Lotte Chemical ranked highest at 94.7 million won. Kia Motors, whose business slid last year from China's retaliation for South Korea's hosting of a US missile defense system, came in at 38th with 93.1 million won, while its sister firm Hyundai Motor followed at 44th with 91.6 million won. Kia's figure, however, is down 2.9 million won from the year before. Hyundai also cut back 2.4 million won from the previous year. Dongwon Industries offered the biggest proportional raise at 37.6 million won, or 67.1 percent, paying 93.6 million won last year. The raise put the fishing and seafood company at 34th, up from 240th.